Atletico Pantoja could be considered a Cinderella story as an international debutante, though an argument can be made that the Dominican first-division club hasn't exactly seen a midnight since its inception. The team, founded in 1999 by a group of friends who played nightly on the fields of a pharmaceutical company, has quickly risen through the domestic ranks over the past two decades and achieved another breakthrough last year. The club pulled off a surprise in winning its first Caribbean Club Championship, giving Pantoja's baseball-crazed home country its second representative in as many years in the CONCACAF Champions League, the region's premier club soccer competition. Pantoja's CCL journey begins Wednesday at its home in Santo Domingo, where it hosts the MLS giant New York Red Bulls in the Round of 16. The teams square off again a week later in the second leg of the aggregate series at Red Bull Arena in Harrison, New Jersey. "We've sacrificed a lot in order to be in the position that we're in," said centre-back Nicolas Rebollo, a Uruguayan national and Pantoja's current captain. To secure that position, Pantoja survived a penalty shootout against Jamaican club Arnett Gardens last May, marking just the second time since the Caribbean Cup began in 1997 that a club from the Dominican Republic has won the tournament. (Cibao won the Cup the year before.) Teams from Jamaica as well as Trinidad and Tobago historically dominate the tournament, with Puerto Rico accounting for three titles of its own between two clubs. According to the club's website, Pantoja's run of success in its busy formative period started with an invitation in its first year to participate in a tournament put on by the Dominican federation. Not only would the club win the tournament, it would also join the country's third division in just its first year of competition. Pantoja quickly proved to be a big fish in a small pond at the next level as well, winning its third trophy in as many years and ascending to the first division. Pantoja captain Nicolas Rebollo, left, has experienced plenty of domestic success with the team but is about to get his first taste of international competition with the club. The club capped its meteoric rise with a first-division title in its inaugural season in the Dominican big leagues -- marking four milestones in four successive seasons. And so, Pantoja's next venture is into international soccer waters. 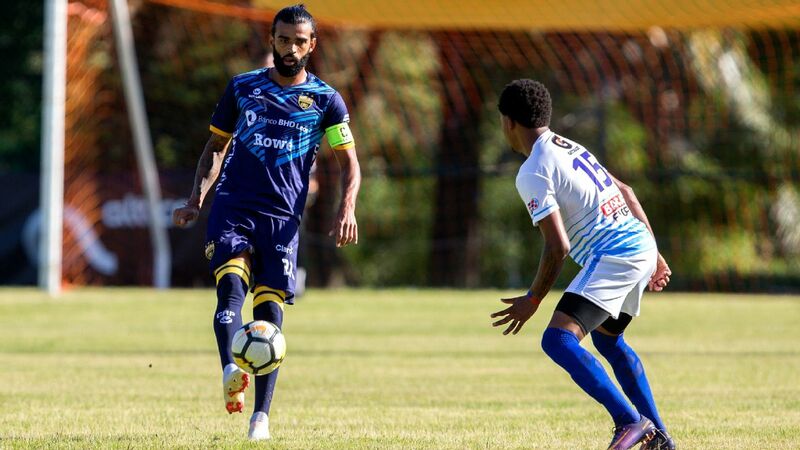 The path to the CCL saw Pantoja take down established Caribbean Cup powers such as W Connection of Trinidad and Jamaica's Portmore United, before the Dominican club's title match against Arnett Gardens. Pantoja fought to a 0-0 draw before emerging in the shootout, 6-5, courtesy of a missed spot-kick. Pantoja's grassroots beginnings and fast rise have kept the team from adopting a laissez-faire approach. Though the current roster has only been together for about six months, manager Oliver Mendoza said their camaraderie makes it appear as if they've been together for a couple of years. "All the players are full-time employees and train twice a day," Mendoza said. "We're really serious about being the best." Rebollo, the captain, is in his fifth season with Pantoja. Though he's experienced domestic success regularly, he noted that something clearly has changed with Pantoja about to make its debut internationally. "We've always been a club with the core values of humility, dedication to hard work and unity, but we understand that now the bar has been raised," Rebollo said. "So we need to meet that challenge head-on." The club will rely on striker Luis Espinal, the Dominican Football League's top scorer this season, to help them against the Red Bulls. Cibao went scoreless in last year's CCL, so one of Pantoja's objectives is to become the first Dominican club to find the net in the tournament. Mendoza said after that, their real test begins. "We don't just want to score," he said. "We want to make a statement, one that says that we belong here. Our goal is to win." Pantoja communications director Fernando Rodriguez said the club has developed a culture befitting its "Warrior" nickname that carried it to the CCL. "We fight for every inch," Fernandez said. "It's in our name." As visitors on Feb. 27 in New York for the second leg, Pantoja certainly is hoping to tap into the support of the area's sizable Dominican representation to help motivate the team to victory. "We hope it's like a home game [at Red Bull Arena]," Mendoza said. "We look forward to having them come out and help level the playing field." So how do they approach a matchup like this? Mendoza said the key is unwavering confidence in your abilities. "We've trained hard for this moment, and we recognize that the Red Bulls are terrific, but we are confident that we can impact the game and be competitive," he said. Mendoza emphasized that Pantoja's plan is to make appearances in the CCL a yearly habit. If that is the case, then this matchup with the Red Bulls will not be the last time we get to enjoy Pantoja on the international stage.